A favorite treat of mine growing up that my Mom would make on special occasions was pigs in a blanket. For those of you who have never been introduced to this delectable little treat you basically take mini sausages, wrap them in a blanket of “from the can” biscuit dough (the kind that has those marvelous poofy layers), pinch the tops together on top of the wee little piggies and pop them in the oven. It’s fast, easy and oh, so very very good. Since removing refined and highly processed foods from my diet as much as possible I had mentally bidden a fond farewell to my childhood piggy treats. A discovery at Trader Joe’s this past week inspired me to attempt a healthy version of that old delicacy. The discovery was nitrite, nitrate, MSG and preservative free hot dogs. The ingredient listing was clean, simple and beautifully straight forward with no mile long names of chemical compounds to go googling for. Now, I still technically consider hot dogs to be pretty processed. But with all the really bad naughty compounds removed, and at a decently affordable price this is a treat I can indulge in once a month or so without too much guilt on either the budget or nutrition front. With the packages of hot dogs purchased however I came face to face with the second dilemma. I don’t buy bread products anymore. I’m one of those all or nothing people that requires drastic measures in order for me to stick with anything. So over a year ago I made myself a rule: If I don’t make it, we don’t buy eat it with all bread products. This has included tortillas, loaf bread, cakes, cookies and oh yeah, hot dog buns. This required some experimenting. And subsequent frustration. More tweaks. More frustration and at last…Oh at beautiful last…Soft, light, chewy, whole wheat, soaked flour buns. (Que the Hallelujah Chorus and heavenly beams of light from above gracing my kitchen as I cradle the precious bun, still warm from the oven in my hands) There were still some small complications…The dough due to the lack of additional lecithin and other “stretchy” additives made the finished product a bit more fragile than store bought buns and they were also despite my best efforts marginally more bulky than the nice standardized sizes you got in the bags. Then in the midst of the hallelujah chorus and heavenly glow the lighting bolt of inspiration struck as I gently nestled the little bun back with it’s comrades. Next time I decided to implement operation full sized piggie blankets Healthy Version 1.0 This entailed gently patting out the dough into oblong shapes and wrapping the full sized wieners in them. Pinch the bottom together and place (bottom down so that the seam is held together as it rises) on a pre-greased baking pan. Allow to rise as normal and bake at 350 until done. They can be eaten warm as soon as they are taken out of the oven. I made extras, allowed them to cool completely and then stored them in the fridge. They tasted just as good reheated in the toaster oven a couple of days later. This was indeed hot dog perfection. Like corn dogs minus the corn and well the stick too. Sooo yeah, not so much like corn dogs. Definitely like full grown Pigs N a Blanket though. Having a toddler I loved how easy this was for her to eat and dip into her organic ketchup or mustard without the bun falling off or the condiments plopping all over the place. 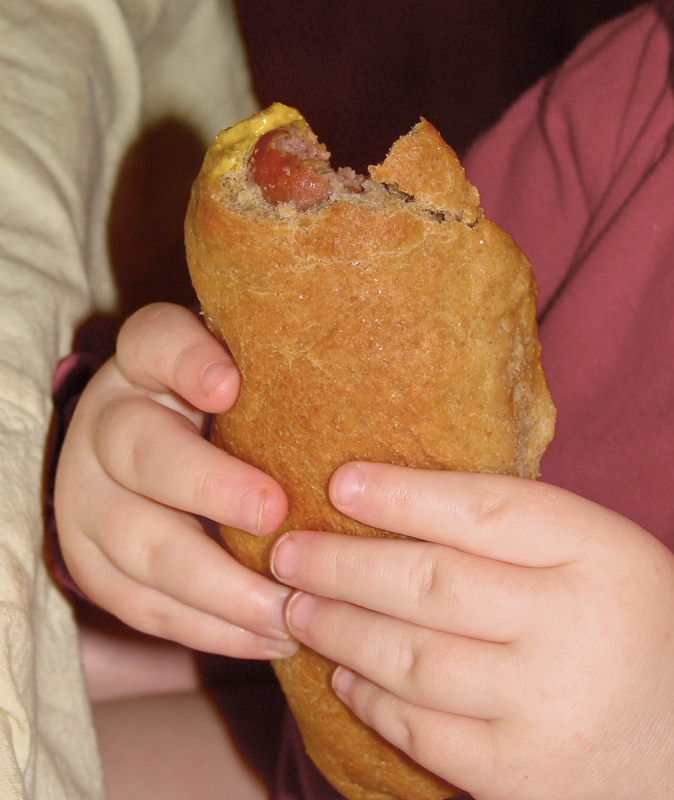 They were by far the neatest toddler hot dog experience we have had yet. So, after that long intro. Here is the dough recipe. Gently warm buttermilk and coconut oil together in a pan. Mix into 4 cups of freshly ground whole wheat flour and create a ball. Cover ball with a moist piece of cheesecloth or wet paper towel. Slide into a warm place (I use a pre-warmed Oven) and leave for 12 to 24 hours. When you are ready to finish converting into the finished product into dough combine the warm water, baking soda, salt, yeast and sorghum together and mix until dissolved. This will look quite foamy by the time it’s stirred together. Work into the soaked dough ball until well mixed in. The dough should be quite sticky and moist now. Work in white flour until the texture is no longer sticky. 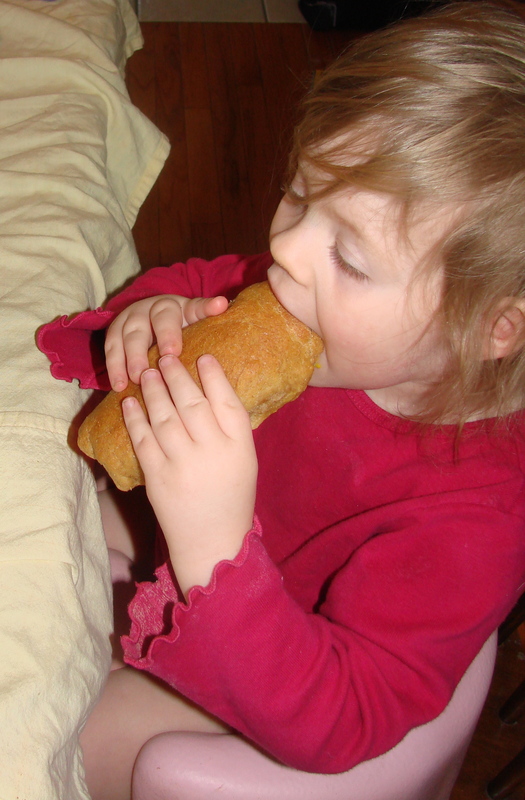 Be careful not to put in too much flour at this point…Hot dog buns require a much softer texture than loaf bread. The dough should still be soft and moist, pretty much the same texture you would want if you were making delectable cinnamon rolls. As soon as the actively “sticky” part is done away with by a sufficient amount of white flour plop the ball of dough back into the bowl, cover with a moist blanket and return it to the warm spot. When it has doubled in size, pull it out, punch it down and see if it needs a wee bit more flour worked into it as you knead. In my experience it requires a bit of extra kneading time for the gluten to activate in soaked flour products than it does in their more typical counterparts. Lately I’ve been doing the kneading by hand although it could just as easily be done in a Bosch or other bread dough mixer. Once the dough has been kneaded, pummeled and yanked around enough to intimidate the possibly reluctant gluten into showing itself you can now pinch off chunks, pat them out and roll the hot dogs up into them. Allow to rise until appropriate fluffines has been obtained and then slide them into a preheated 350 oven to bake. Any extra dough can be turned into cinnamon rolls or regular dinner rolls. The texture is very light and soft. Bake at 350 until done. Mine took around 30 minutes. Nummy! We have had those hot dogs. Best I’ve ever tasted! Quite a splurge, but worth it once in a while. Ahhhhh, chubby fingers…. cute overload! Great Post… have to say.. have not had a hotdog in many many years… Trader Joes would have the best by far.